The Americans with Disabilities Act, or ADA, requires institutions receiving public money or providing a public service, including colleges, offer a level playing field to people who have disabilities. In 2008, the act was amended to expand the definition of disability. 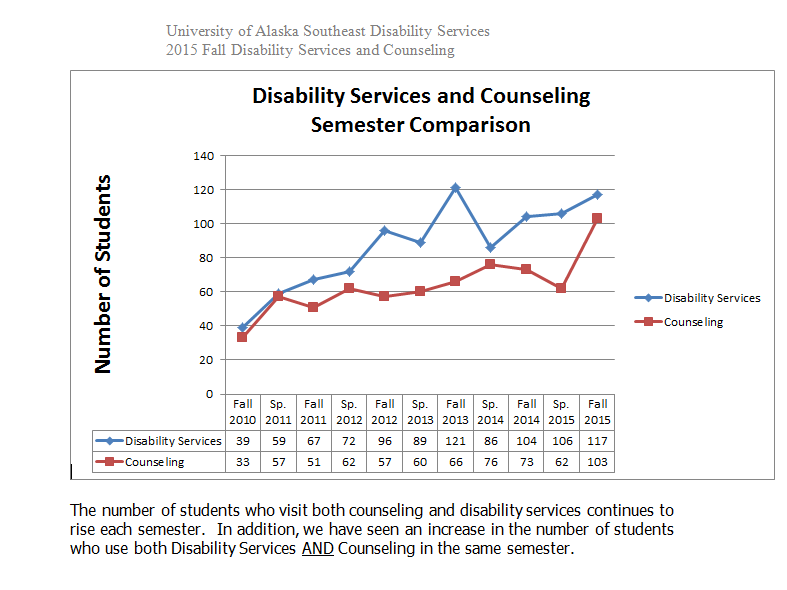 That fall, 23 University of Alaska Southeast students were using disability services. By the spring semester of this year, there were 119. The upward trend is also true at the Universities of Alaska Anchorage and Fairbanks, but it’s not as dramatic. 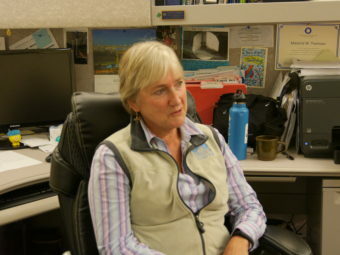 Margie Thomson is the coordinator of counseling and disability services for the UAS Juneau campus. She thinks there are a couple of reasons for the increase including the amendment toADA. Thomson said hidden disabilities are conditions that aren’t easy to see like mental health conditions, medical issues, or learning disabilities like dyslexia. She said students’ temporary disabilities are usually the result of injuries, surgeries and other short-term medical conditions. She was a one-person office when she started in disability services the year the ADA amendment passed. About three years ago the campus hired another person part-time to help out. Many times, she said, faculty don’t recognize hidden disabilities. Traci Taylor works in the Juneau campus’ IT department and is considering going to graduate school. She graduated from UAS in May with a degree in marine biology. Thomson said Taylor struggles with a disability that might not have been covered by ADA before the 2008 amendment. 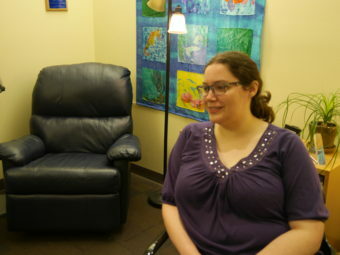 A couple of her teachers did notice her struggling and recommended she go to the Disability Services office. She said she did and the staff recommended she use a Livescribe pen, which recorded lectures for her. Test proctoring is just one disability service the university system provides. Taylor said her test scores improved and school got easier. She said other students who think they could have a disability should speak up and get help. Doug Toelle is with Access Alaska, an independent living center and advocate for the disabled based in Anchorage. He has his own theories for the increase. 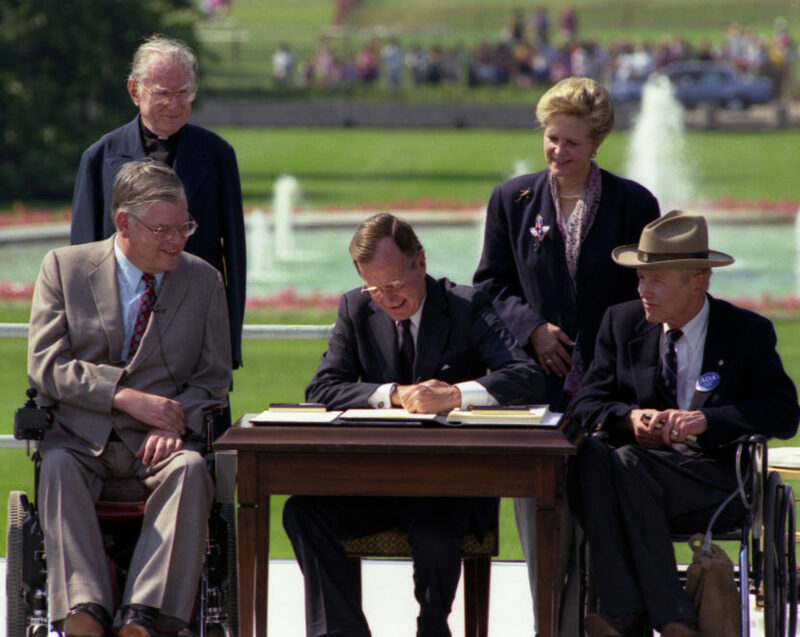 P14777-18 President Bush signs the Americans with Disabilities Act on the South Lawn of the White House. Sharing the dais with the President and he signs the Act are (standing left to right): Rev. Harold Wilkie of Clairmont, California; Sandra Parrino, National Council on Disability; (seated left to right): Evan Kemp, Chairman, Equal Opportunity Commission; and Justin Dart, Presidential Commission on Employment of People with Disabilities. Mrs. Bush and Vice President Quayle participate in the Ceremony. Additionally, Toelle said there are likely more veterans with “hidden disabilities” coming into Alaska’s universities. According to the U.S. Department of Veterans Affairs, more than 73,000 veterans were living in Alaska between 2013 and 2014. University officials couldn’t readily produce dollar figures for what it costs to provide disability services. However, citing fear of violating the ADA, they requested an additional $250,000 for disability services earlier this year. The legislature denied it.